FINAL FANTASY’S new album will be “a romantic epic about nothingness” featuring love songs to women that will nonetheless be “still pretty gay”. Strange? Probably. Intriguing? Yes. And the man behind it all is coming to play these songs in Galway. 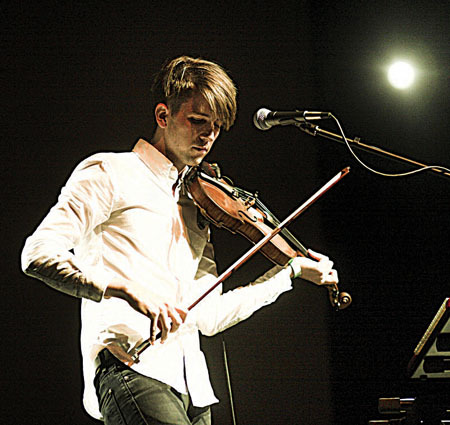 Final Fantasy, the one man solo project of Canadian singer, composer, violinist, and arranger Owen Pallett, will play the Róisín Dubh on Saturday May 30 at 8pm as part of the venue’s Once Upon A Time In The West fifth birthday celebrations. Owen was born in Toronto in 1979 and grew up in a family where classical music was central - his father is an church organist. He began studying music at a young age, learning both violin and piano. Over the last 10 years, the Canadian indie music scene has been among the healthiest and most creative in the world. It was no surprise that someone of Owen’s precocious gifts would not only become involved but be actively sought out by others for help and collaboration. Owen had been a member of Toronto trio Les Mouches, was violinist in Picastro, and played keyboards in SS Cardiacs. However in late 2003/2004 Arcade Fire, then largely unknown outside Canada, were recording their debut album Funeral, and asked Owen to do the string arrangements for it. How did he come to work the band? Funeral would establish Arcade Fire as the coolest band on the planet, with indie hipsters trying to outdo each other in the “I heard of them first” claims, and laying the ground for the even more successful Neon Bible in 2007. When he was working on Funeral, did Owen have a sense the band would become the phenomenon they are now? Owen is not merely someone else’s arranger and collaborator, he is a solo artist of the highest calibre. He took his stage name from the video game Final Fantasy, and although he is a fan of gaming, he would not describe himself as either an avid or obsessive gamer. In 2005 Owen released his debut album as Final Fantasy. Entitled Has A Good Home, it was praised by The Village Voice as having “the best lyrics of the year” while Pitchfork said “it can engage you on a level most albums can’t”. Has A Good Home also went on to win the inaugural Polaris Prize for best Canadian full-length album. He followed this up in 2006 with the curiously titled He Poos Clouds, which was evidently inspired by the magic schools in Dungeons & Dragons. Owen is currently in the studio working on a new album. What can he tell us about it?